Hot on the heels of their fourth landmark event in Barcelona, DGTL has now revealed new details regarding their upcoming debut edition in Madrid. Set to take place on December 5th at IFEMA (Feria de Madrid) the event will bring solid headliners, local talent as well as emerging international acts over to the country’s capital. DGTL prides itself for always experimenting with their line-ups, from keeping a close eye on local talent to making sure that their headliners are a good fit for the local crowd. Techno buffs will be pleased to know that the billing includes iconic Detroit veteran Robert Hood and Berlin-based craftsman Len Faki. Robert Hood, being one of the founders of the legendary Underground Resistance label will undoubtedly be on top of his techno game while Len Faki’s years as a Berghain resident will certainly come in handy too. Two of house and techno’s biggest names, Âme and Mathew Jonson will be going back to back for a special live set. The two have both been able to put a distinct mark on the music scene in their own unique way. Jonson by offering a rare fusion of populist intensities and nuanced musicality and Âme by being the core of one of dance music’s most respected labels, Innvervisions, alongside Dixon. To ensure a balanced selection of artists, the line-up will also see emerging international and local talent alongside headlining acts. Starring, among others, Charlotte de Witte and JP Enfant, hailing from Belgium and Holland respectively, DGTL plays it close to their roots. In terms of local talent, one can’t get around Versions [live], consisting of Psyk and Tadeo, they are one of Madrid’s most prolific duos and a definite must-have at the event. While technically not really a Madrid citizen, John Talabot has established himself over the years as one of the true staples in Spain’s music scene and a worthy representative of the country on the bill. 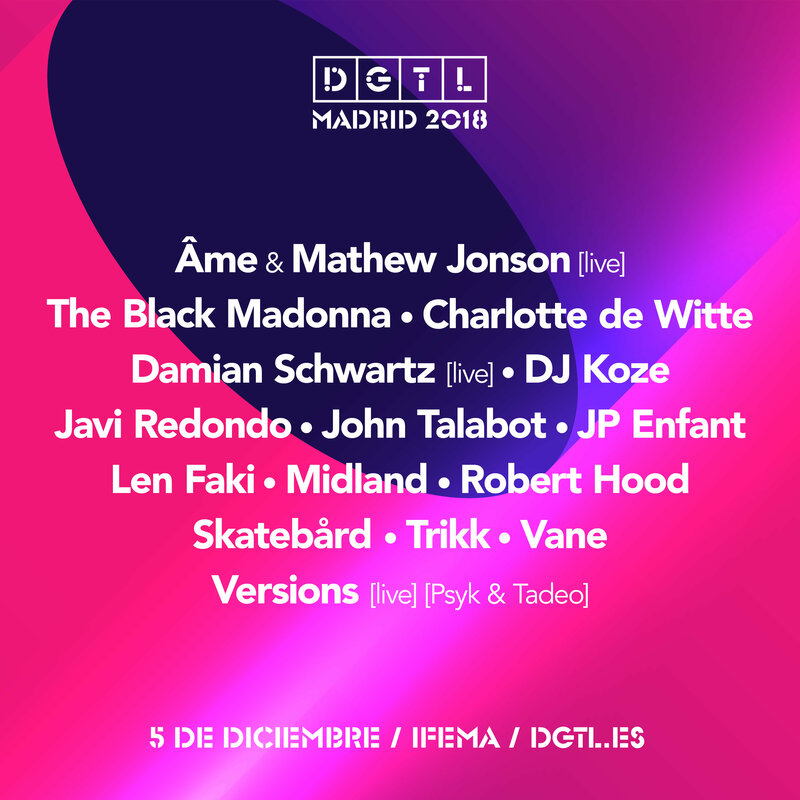 Also performing at DGTL Madrid are Midland, Skatebård and Trikk, three unique acts from completely different places and scenes in Europe. Being on the path to become the first ever circular festival by 2020, DGTL will also be implementing some of their many sustainable practices during its Madrid debut. As part of their Revolution program, DGTL always strives to keep their environmental impact to an absolute minimum and has been on the forefront in this field for years. In line with their modus operandi, art will be seamlessly blended into the festival site, with more information on installations and artists to be revealed closer to the event date. Check out the DGTL MDRD taeser video here!